The MFC-J4420DW color inkjet all-in-one also has a duplex printing function that allows you to print two-sided pages to help save money on paper. The automatic document feeder (ADF) helps save time with multi-page copy, scan and fax. You can also print on up to 11”x17” paper by using the single-sheet bypass tray. An easy to read 2.7" color touchscreen display has simple menu navigation and is easy to set up. 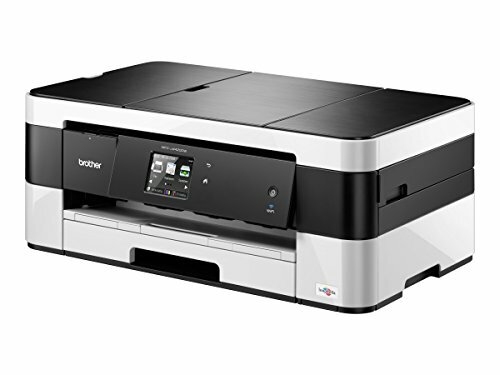 The Brother MFCJ4420DW contains an innovative landscape print technology feature that stores and feeds paper in a landscape orientation as a space-saving design. This color Inkjet is also Amazon Dash Replenishment enabled upon activation. This system allows the all-in-one to measure the ink level of your Genuine Brother Replacement Cartridges and order them directly from Amazon.com. It ensures that you never run out of ink so you can maintain office efficiency. (1)Requires connection to a wireless network. (2)Requires internet connection and an account with desired service. (3)Based on ISO/IEC 24734 (after first set of ISO test pages). For more details, see manufacturer’s website.